Home Theater is truly the sum of many elements. But it is more than wires, speakers, a projector, remotes, and a DVD player, much like a home is more than timber, bricks, and concrete. It takes a skilled contractor to form a home out of the raw materials, and so it really does take skilled technicians to create a theater out of the raw elements of speakers, wires, and electronics. Knowing the formula to calculate speaker placement, seating arrangement and screen size, as well as designing it beautifully is what separates our theaters from the norm. 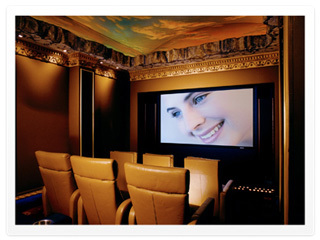 It is the honed expertise of our installation technicians that makes MODIA theaters the stuff of dreams. Your dreams and our expertise are the winning combination for home theater brilliance. Come to us in one of our beautiful showrooms or we can come to you, in your home. Check out our Store Locator or call 800.877.2900. Copyright 2017 MODIA. All Rights Reserved.